Security of portable devices such as tablets and laptops is ever more important in this day where our digital lives are literally on them. Microsoft recognized this with Windows 8.1 and enabled a new Device Encryption when they released the update last year. The idea behind Device Encryption is that your device is secure and the recovery key for that encryption is stored on Microsoft’s servers, associated with your Microsoft account (yes, they have access to the key but only access it for law enforcement needs). Should your Windows 8.1 tablet or PC be stolen or lost, the content of that drive is encrypted and unless someone has your PIN or password then the contents of the device will not be something they can access. 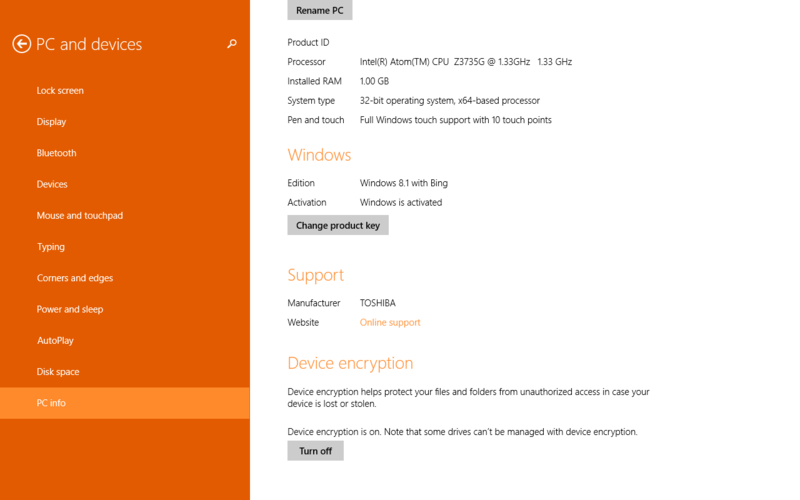 In this How To I’m going to show you how you can disable the Device Encryption on your Windows 8.1 tablet or PC. It is easy to disable (and enable) but it is a bit buried in the PC Settings. Now, just because you can do a thing doesn’t mean that you should do a thing. Really, there is no reason to follow this How To and turn off encryption. It is for your own safety and personal data security which is why Microsoft has enabled it by default. If you aren’t comfortable with Microsoft having the recovery key, that’s fine. Follow this How To so you can disable it then re-encrypt with another encryption software. support InstantGo for encryption to be available. Check with your PC manufacture to verify if your device is compatible. In the Device Encryption settings you will see a Turn Off button. Tap that button and you will get a warning you that your files will be unprotected and that the decryption process can take a long time. If you still want to do it, tap the Turn Off button again and the decryption process will being. Exactly how long this will take will largely depend on the size of the hard disk in your device. For small devices like my Toshiba Encore 2 which has 32GB of storage, it took about 30 minutes. Your mileage may vary of course but again, you don’t really need to do this unless you want to go commando style with your files and data. For other How To’s for Windows and Windows Phone, be sure to check out my How To pages. If you have a tip or trick you’d like to share, use the Contact page and let me know. When I post it I’ll make sure you get the proper credit.